Andrew Goldring's entire existence as a solo artist seems to hinge on pure, naturalistic coincidence. His first record—essentially a collection of stray songs that never found a home with his old band, Golden Sun—was hastily recorded in 2013 and released as little more than a lark. "I wasn't really trying to do the whole 'solo artist' thing seriously," Goldring says of 2013's Forgotten Harvest EP. "I wasn't looking to be playing gigs. It was just a fun one-off thing." Goldring soon moved on to other endeavors, fronting alt-rock foursome Great Interstate from 2014 to 2015 and racking up experience as both a songwriter and a producer. However, by mid-2016, Great Interstate was fizzling out, and Goldring found himself at something of a crossroads. "I had to decide whether to try to rebuild this band with a bunch of new people, or just bag it and try something different," he says. "That's what led me back to doing a solo project. It was time for a change." 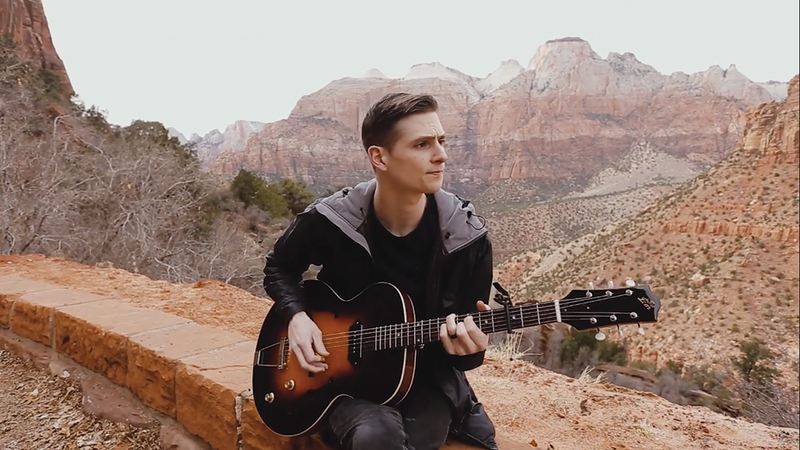 The Utah-based artist might have struck out on his own artistically, but his appetite for collaboration is stronger than ever, whether it's teaming up with Baltimore dream-pop band June Pastel for "Leaving Song" last year or enlisting the help of producer Jon O'Brien for his upcoming full-length, Fluorescent Memories. "[Jon] and I connected through some mutual friends that I have out in Southern California," Goldring says. "I was looking to branch out and work with a producer, because every time I've gone through [the recording process], I've wanted to hand more parts of it off to other people." Goldring booked a day in O'Brien's California studio while on tour and the two hit it off, recording new single "Chemical Spirit Connection" in a single session. He was impressed by what O'Brien brought to the table. "He just has such a good taste in arrangements—and he has a lot of great instruments at his studio that I don't have out here," Goldring says. "It was cool because I got to exercise my creativity as a producer, but at the same time get a second opinion and hand it over to someone else"
In true Goldring fashion, Fluorescent Memories sprang forth without much forethought. "Honestly, it kind of happened by accident," he recalls. "I didn't really set out to make an album or an EP or whatever. I was just like, 'I'm gonna write some music and see how far I get.'" The result was Goldring's first full-length album as a solo artist, a set of 10 tracks largely written in a fit of inspiration following the recording of "Chemical Spirit Connection." "When I got back from that first session with Jon, I was really pumped and just kept writing," Goldring says. "I built a new home studio in my house, and that new space was partially what inspired it, since it became a personal creative space." According to Goldring, allowing himself to be guided wherever the music wanted to go was a learning process. "I think when I first started doing solo stuff, I was a little bit more timid about it," he says. "When it's not collaborative and you're not consistently bouncing ideas off of other people, it's easy to limit yourself. It's easy to think, 'Oh, I'm a singer-songwriter, so I have to sound a specific way. It has to be folky, I have to be a certain genre ...' That's what's been cool about this new record—I let go of a lot of the restrictions in my mind and just let things be what they wanted to be." That attitude is clearly reflected in Goldring's newer material. The songs released in anticipation of Fluorescent Memories resist easy categorization, retaining the aforementioned folksiness typical of modern singer-songwriters while blending in healthy amounts of psychedelia and grittier shades of indie rock. Even Goldring himself has trouble placing his sound in a definitive way. "I always wonder what people think it sounds like, because I never know," he admits. "I mean, I know who my influences are, but I don't know if I actually sound like my influences ... It's been cool to watch on Spotify; it'll show you who people are linking you to, and what it's recommending based on your music." Fluorescent Memories is slated to drop Feb. 8, and Goldring marks the occasion with an album release show at The Urban Lounge alongside fellow Salt Lake City songsmiths Josaleigh Pollett and Night Marcher. Goldring is excited to return to the stalwart local venue, citing his December gig supporting City Ghost there as one of "my favorite shows that I've played in a long time." If his new songs are any indication, this upcoming performance seems poised to top that one. But who knows? As Goldring says, "Let things be what they want to be."